If you’ve not hiked to the top of the Devils head trail and climbed the 143 steps to the fire lookout, then I think you’re not allowed to have one of those Colorado Native bumper stickers. 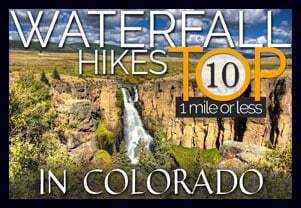 The Devils Head trail is the classic Colorado Front Range hike and is just about a hour from the center of Denver. The views from the top offer a 360 degree panorama of mountains layered upon mountains. 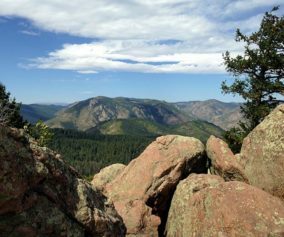 Scroll down to explore the trail profile and photos of one of the best hikes on the Colorado Front Range. 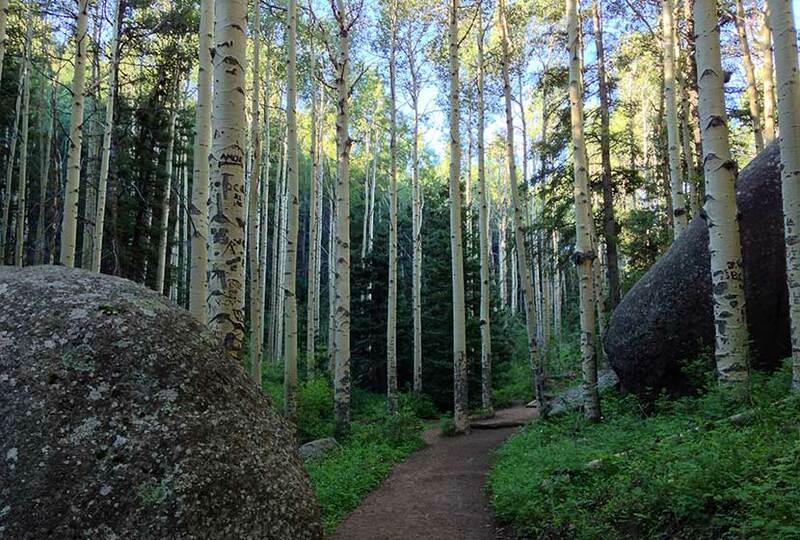 This Colorado hike begins in a glade of tall aspens, some of the biggest we’ve seen this close to Denver. 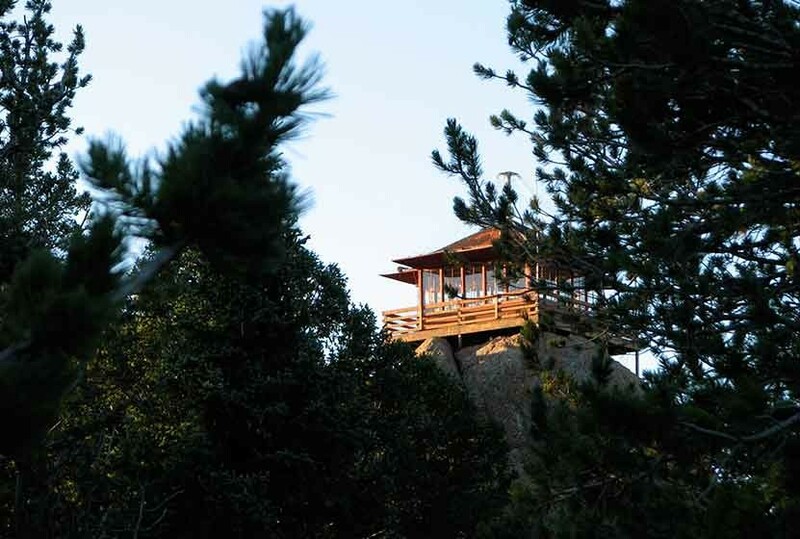 Then the trail meanders through some unusual rock formations until the trail opens into a high meadow where a quaint ranger cabin sits nestled in the trees. Up ahead and to your left, you’ll see the red steps that lead to the Devil’s Head fire lookout. 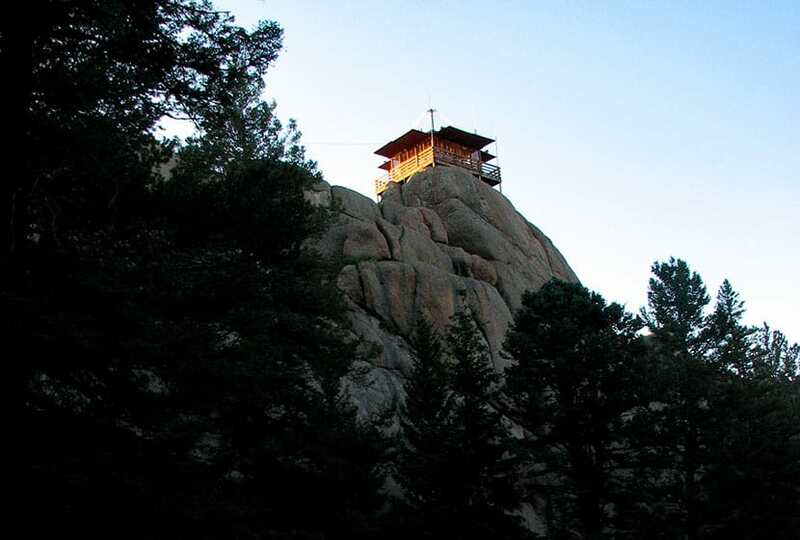 The Devil’s Head fire lookout is the only operational fire lookout in the state of Colorado and is over 100 years old, though the current structure was built in 1951. If you are a history buff and enjoy historical photos, check out these this site: Firelookout.org . link to the Devils Head Article by the Denver Post. 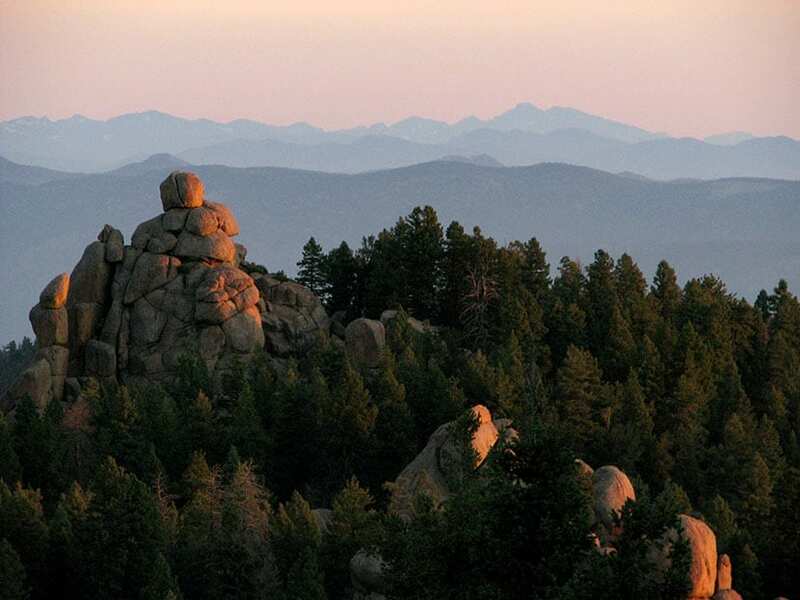 The views from Devil’s head reveal features of Colorado’s Front Range that are rarely discovered. My favorite is looking North down the spine of the foothills where red tinted rock formations push up from the peaks and resemble a chain of castles high above the forest. 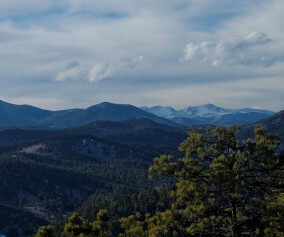 Pikes Peak dominates the landscape to the South. And the Western view from Devil’s Head is riddled with the red mountains of the Tarryalls, Kenoshas, and Platte range. And there are few signs of civilization, at least not in the early morning hours when I took these photos. 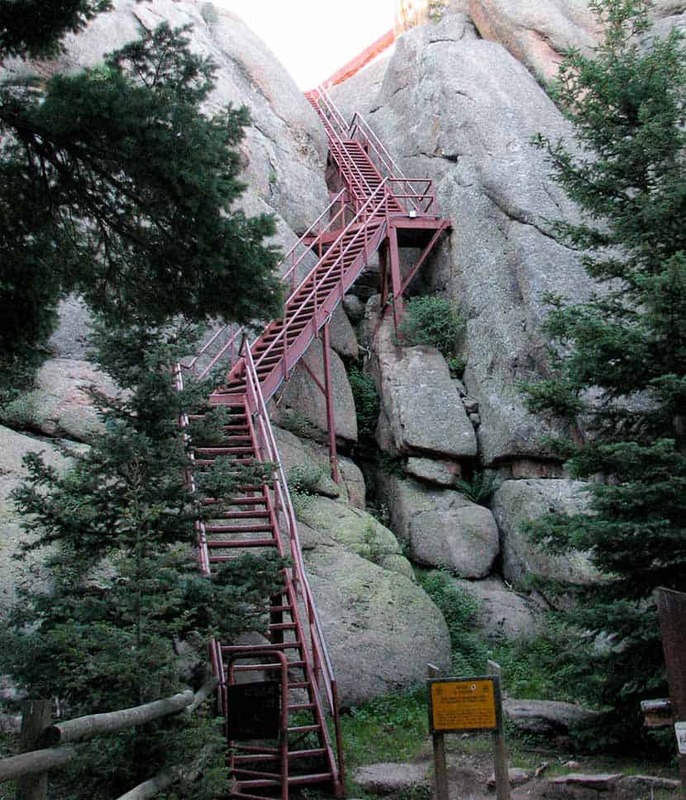 TIP: Go Early: Devil’s Head is one of the most popular hikes on the front range. If you are hiking this on the weekend, try to get to the trailhead by 8am if you want a less crowded experience hiking Devils Head. 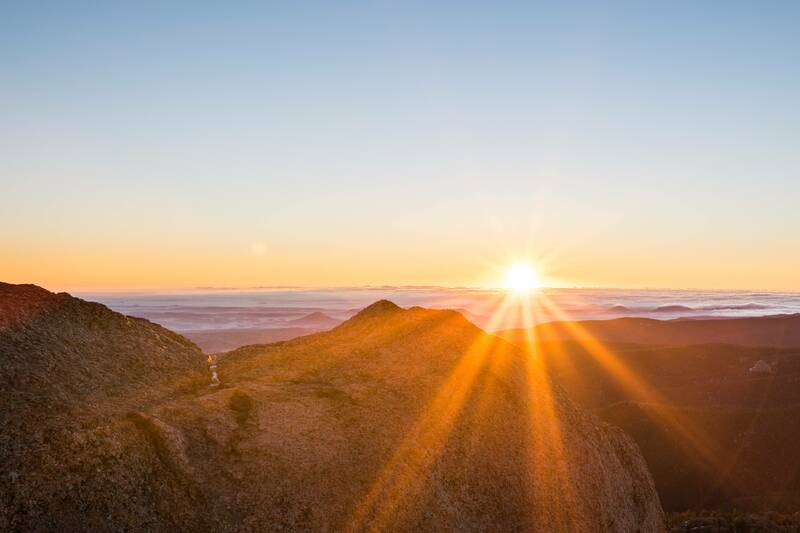 TIP: Go Even Earlier for photography: The rising sun lights up the front range, and you can see hundreds of miles of mountains from the tower on Devil’s Head. Camping: There is a USFS campground near the trailhead parking area. Some friends of ours have camped here and said it was a good experience. See the USFS Devils Head Campground site for details on camping and parking fees. TIP: Rough Drive: The 10 miles of Rampart Range Road can be dusty and a real washboard experience. 2WD is sufficient and this road is kept in pretty good condition, but be prepared for a less than comfortable drive on your way to Devils Head. TIP: Rampart Range Road is closed December 1st to about April 1st each year. You can call the South Platte Ranger District at 303.275.5610 to get the current status of the road. TIP: Be Lightning Aware: The front range is notorious for its lightning strikes and this is the highest point. If weather is looking bad, play it safe. This trail was fun. Great for families. And up on fire tower between 9-5 most days, is Bill Ellis, the mountain sage, he is full of stories, and definitely make a point of introducing your self and chatting. I had a little trouble finding the turnoff in Sedalia, with no GPS, and the roads up the mountain were manageable for my Honda Accord 1996, but only in perfect weather. Otherwise, car with good tires and/or 4WD would be needed. A Friend, and I enjoyed climbing the rocks and spending time contemplating the Colorado Landscape great hike, easy, and fun. We just did this trail yesterday (October 2013) and it’s now our favorite day-hike that we’ve found using this website. As the tip above says for this trail, brace yourself for a washboard experience when driving the last ~9 miles on Rampart Range Road. This dirt road is actually in good condition and well-maintained (no potholes), it just has very bumpy spots due to high use. When we started the drive on Rampart Range Road it was raining and we were a little unsure of whether or not we’d be doing the full hike. Then, by the time we got to the trailhead parking lot it had turned to snow due to the gain in elevation! It ended up being a lovely hike up. The further we hiked, the more it began to look like a winter wonderland. The hike up felt like a bit longer than ~1.4 miles to us because of the elevation gain. This is definitely not a difficult trail (very well maintained, not super steep), but make sure that those who are hiking are prepared for going up-hill the whole way. This would probably be a bit of a struggle for family or friends visiting from sea-level. Once we got to the base of the stairs for the tower, we weren’t even sure if it would be worth it to go up since it seemed like we were really socked in with snow. Wow though! By the time we were half-way up we already had amazingly beautiful views. The stairs are steep and do feel a bit rickety (especially when wet like they were for us), so definitely not for someone with a fear of heights. However, once we were up we were so, so glad we’d done this hike. It was one of the prettiest 360 views we’ve seen in Colorado. While we were there it actually started to clear with the sun coming out, which made it even more beautiful. We would happily do this trail again and again! I would like to see this at Sunset. Is this safe to come down at night? John, the trail is closed at the time of this reply. I’d say that “safe” is a relative term because no hiking is really safe. I ran up the trail at dawn and it was fine, but I would imagine that it would get dark very quickly after sunset. For sunset hikes, I recommend hiking with someone, and to having a headlamp or flashlight on you. I live in Western Australia and hike a lot (usually in very hot conditions). I’m travelling to Denver in June 2016. I was wondering how manageable it is for a tourist to take this Devil’s Head Lookout hike as a day trip from the Convention Centre location in Denver? I have found from experience that, internationally, “hike” is a relative term – a bit like “safe” – so thought you might have some clarification for that time of the year. Proper walking boots and sticks, or just joggers? Is 2.5 hours for wandering or striding? Mostly path or rock hopping? The view looks lovely and worth doing, but maybe we can visit another hike as well, especially if this one is easy-ish at that time of year. Any advice is appreciated. Thanks! Jan, This is still quite a drive from the city center and along a sometimes rugged dirt road. It’s not hard in the sense of rock hopping or navigating the trail. It’s relatively even and moderate in demand. Plan with a buffer and make for a 3-4 hour trek, stay the trail, and go early. I’d recommend leaving the city center by 6:15AM so as to get around rush hour traffic and to get up onto Devil’s Head before afternoon thunderstorms come up. An easier and closer alternative is to hike the Trading Post Trail at Red Rocks. That’s the trail that I most often recommend to those who have short stays in downtown Denver. 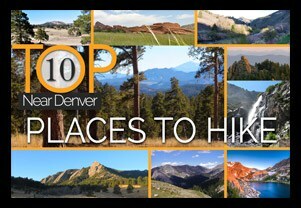 Finally, be sure to download our hiking guide (in the right-side bar of the site) and to pack the 10 Essentials. Cheers, Aaron. Thanks for the tips and the very useful hiking guide, Aaron. Much appreciated. Good to see you out with the family – your little one will grow up to love fresh air and trekking too, like my sons have done. I can see from the elevation notes that the unfamiliar “rare air” might slow me down, but I’ll take your sensible advice and aim for a very early start and take my time. 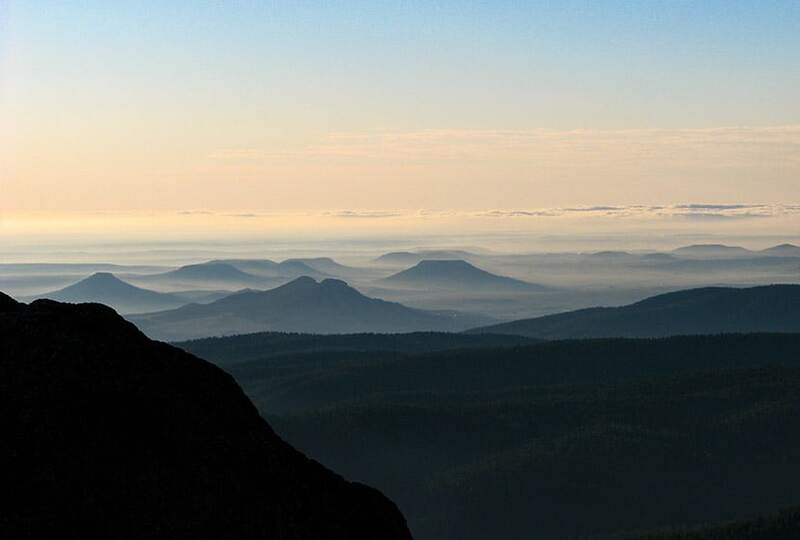 BTW – on which bushwalk was the front cover photo taken? It’s very beautiful country! Hi Aaron, do you know if the trail has reopened? Thx! I am wanting to hike here tomorrow morning, but I noticed on July 30th your post said the trail was closed. Is it open at this time? Yes, the trail has been reopened. Hiked to Devil’s Head lookout this afternoon — a 46-year-old out-of-shape dad and his 13-year-old in-much-better-shape daughter. Trail was in good condition, albeit fairly crowded; Rampart Range Road was in rougher condition — well rutted and washboarded. The trail starts out past a significant “blowdown” from an EF-1 tornado that blew through in July 2015, but clears up nicely once you pass the wooden bridge. Beautiful sub-alpine forest along the trail, with interesting rock formations along the way. 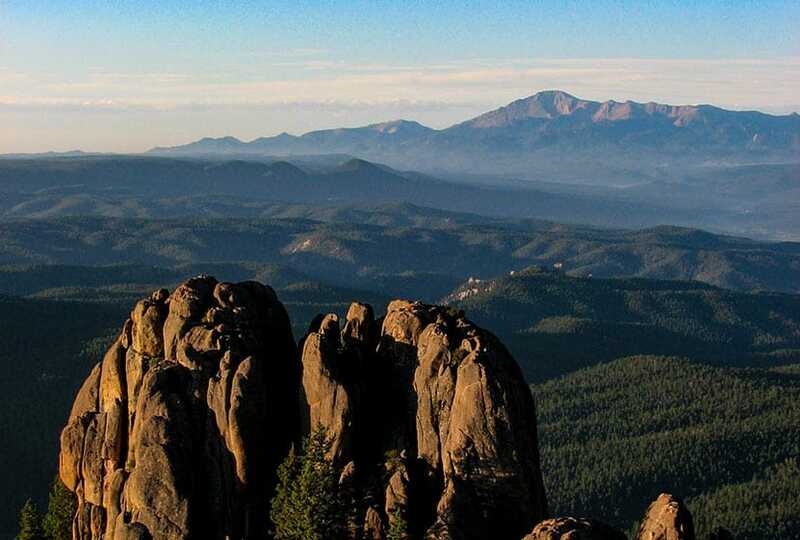 The lookout tower boasts great views from Pikes Peak (south) to Longs Peak / Mount Meeker (north), and from the plains (east) to Mount Evans and beyond (northwest). 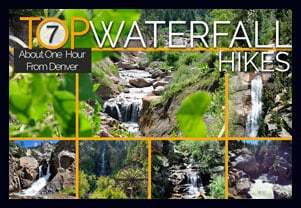 Great family-friendly hike that can be completed in less than three hours! Thanks, AJ, for all of your work on this site! I’m wondering how the stairs are. Are they appropriate for dogs? Hi Christa, I wouldn’t advise taking a dog up, mostly out of respect and safety of hikers as the stairs are narrow, steep, and not made for that kind of traffic.They are stable, just not what you’d consider normal steps. I went on this past Saturday, Nov 7th, for the sunrise. I’ve got to say that I was not a fan of the dirt road leading there, a lot of washboarding, but it’s pretty expected of a dirt road anyway. The last mile of road to the campground/trail head is closed so I had to park in front of the “closed” gate and walk from there. I don’t know how populated the trail is throughout the day, I started my hike at 5:40 a.m. to get there by 6:40 when sunrise occurred. When I got back down at around 8:50, there were two couples starting their way up. If you’re going to go see the sunrise, like I did, be sure to bundle up. It was 19 degrees when I started my hike. You do get warm while hiking, but if you’re going to stick around at the top to take pictures you’ll get cold (you don’t move much while taking pictures). I hiked this last weekend, Nov. 14th. Rampart Range Road was the biggest difficulty of the whole morning. Fortunately, I have a full size SUV, however I did pass a Subaru wagon on my descent. I would imagine that after this weeks snowfall and depending on the traffic since, it would be pretty difficult to reach the trail head with anything less than a SUV or Truck. Christa, there are less than 250-300 metal, icy (west facing) stairs. I brought my 7 yr. old yellow lab Ike with me and he did fine. No issues. We were at the Lookout by 7:50 am, clear skies, no wind, quiet, 100 mile view. Enjoyed a nice breakfast with Ike and headed on back. No other hikers at that time. When I got back to the vehicle, two other gentlemen were about to set off. The last stretch is a climb on 143 stairs. Beautiful hike! Well worth it. Descending, as a 52 year old woman, I really had to be careful by taking baby steps as the trail is slick from loose gravel. One tall young man slid on the gravel coming down the trail and fell on his behind. Went on Father’s Day and the trail was quite crowded yet the people were friendly. I haven’t hiked this trail before. I like to hike alone but always get concerned about safety. Is this a hike that is fairly busy with people and wouldn’t feel like I am out in the middle of nowhere if I needed help? 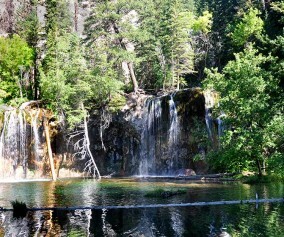 I most likely would be doing this hike during the week in the morning. This is usually a busy hike in the Summer months. However, a weekday morning will be less busy. I believe that during this time of year there is also someone stationed at the cabin and tower. Thanks for letting all of us know. Hopefully, they will be able to begin offering it again in the near future. Since the weather has been nice is the trail head open tomorrow morning. I read that you should go Mid-May- Mid-Sept. Just didn’t want to drive that far if it was closed for the season. Thanks! Is this hike open now = March? As long as the road is open and my understanding is that Rampart Range is weather dependant. However, I would recommend calling the South Platte Ranger district to confirm at 303.275.5610 before driving all the way out there. Great historical area…Bill is super! If in good shape, trail and stairs should be a breeze…on other hand, the 300 + people we encountered in 2 hours was…quite honestly gross…the clueless parents allowing their kids to yell, scream, hog the trail, zero trail etiquette is disgusting and disrespectful to others…NEVER go on a wknd! Hey everybody, I just went on this trail yesterday afternoon (Father’s Day June 18th 2017) and am still blown away by the views. I’ve hiked (relative term as i saw a lady with sandals and she seemed fine and most people just had athletic shoes on) many places around Denver/Boulder/CO Springs and this is by FAR the best view I’ve ever seen. The 360 degree view from the tower is breathtaking and unlike anything I have ever quite seen before. The hike up did take a bit longer than expected (though with some great rock formations you can climb up on to get great views along the way up) but my girlfriend and I found another path you can take up/down that cuts the time each way in half if not more (albeit not as many views as the long way) that is marked by orange tape around a tree near the top and orange tape around a wooden fence looking object just to the right of the foot-bridge near where the tornado downed all the trees. It saved us a ton of time coming down as it was nearing nightfall and we had taken our time walking up the long way and stopping at all the places to take pictures. Cheers and enjoy! Ps. We went around 4pm on a Sunday and it wasn’t too crowded at all, however there isn’t much parking close to the trail and the Rampart Range Road is the most/longest annoying/bumpy road I think I’ve ever had the misfortune of driving on, wont be taking my Lexus on that road again! I know this is a silly question but what is an address to get there? Can I get an estimated time to do the trail and get to the tower? Any more info will be greatly appreciated. I don’t know if the trailhead has a physical address. However, we’ve dropped a pin on the trailhead in the google map and provide google map directions in the trail snapshot. I’d recommend printing this one off though before going as you may lose cell coverage. The trail season says Mid May to Mid September. I am visiting next week (Mid-October 2017) and wanted to make sure this trail is still open. Thanks! The trail and road will be open dependent on weather. Current conditions as of the posting of this reply comment look good, but things can change quickly. I’d recommend keeping an eye on the weather and making your decision closer to the day of the hike. Be sure to pack the 10 Essentials! I’m afraid of heights. How terrifying are the stairs. Is at least one side near something solid? If your afraid of heights then this will definitely be a challenge. However, there are handrails all the way up the stairs. I am planning to take my 9 year old daughter with me on this hike. We were hoping to see the sunrise but I wasn’t sure how safe it was to hike the trail before sunlight and if we would even be able to see. Anyone have experience with this? Thanks in advance! I would recommend talking with a Ranger at the South Platte Ranger district to get the best answer to your question. Their number is 303.275.5610.